Pickled okra saves the summer’s tastes for months to come with the happy additions of garlic, dill, and hot red peppers. The pickles are crisp, tasty accompaniments to burgers or barbecue, and also wonderful served as part of an appetizer or charcuterie platter. Look for firm, springy pods, free of bruises and dark spots, and no more than three inches long. Sterilize five pint jars and prepare lids. While jars are boiling, wash okra and trim stems, leaving caps intact. Combine vinegar, salt, dill seeds, and 3 cups water in large stainless steel saucepan. Bring to a boil. Place 1 garlic clove and, if desired, 1 hot pepper half in each hot jar. 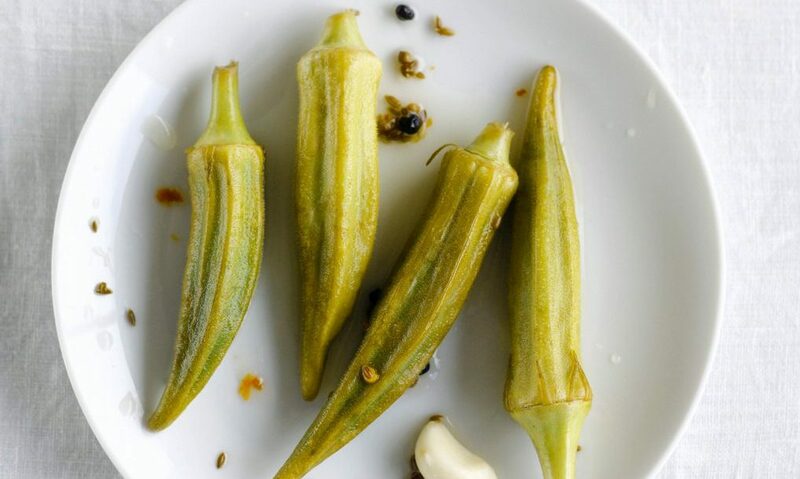 Pack okra pods tightly in jars, placing some stem end down and some stem end up and leaving ½ inch headspace. Cover okra with hot pickling liquid, leaving 1/2-inch headspace. Seal and process jars for 10 minutes. Remove jars from water, and let stand, undisturbed, at room temperature 24 hours. To check seals, remove the bands, and press down on the center of each lid. If the lid does not move, the jar is sealed. If the lid depresses and pops up again, the jar is not sealed. Store properly sealed jars in a cool, dark place for up to a year. Refrigerate after opening. This entry was posted in Eat Good Food, Preserve the Season and tagged oka, recipe, Southern food.